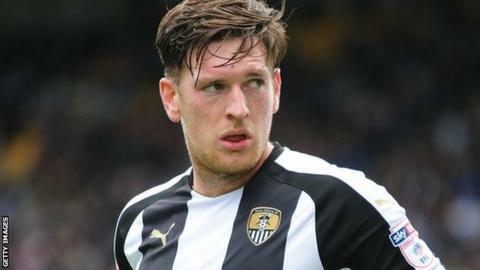 Notts County defender Matt Tootle says gambling is "rife" in football as he revealed his own problems with betting. The 27-year-old spoke in 2017 about how he had been dealing with mental health issues. Tootle said on Twitter on Wednesday: "I've been a compulsive gambler for as long as I remember and it has brought to me some of my worst memories. The Magpies tweeted in support of their defender, saying: "We have been helping Toots through this and are liaising with the EFL to identify if they can offer any further support." Gambling on football is banned by the game's authorities in the UK to avoid conflicts of interest and maintain the sport's integrity. Last year ex-Wales and Arsenal striker John Hartson - a former gambling addict - said six top-flight managers in Scotland and England had recently asked him to help their players tackle gambling addiction, while another former player, Matthew Etherington, claimed some gambling companies targeted players because of their high disposable incomes. Tootle revealed during Mental Health Awareness week in 2017 how he was getting his career back on track and overcoming his mental health problems - and has now opened up about his gambling problems via social media. "Many times I have tried to quit and been unsuccessful and almost lost loved ones closest to me who tried to help," he said. "It's an illness and until you decide you actually want to help yourself you will never get over it. "I'm now one month clean from betting and I'm proud of it. On top of my mental health, I understand I'm a complicated character, but one thing I'm sure of is my strength deep within which makes me never give up in any walk of life. "I think the best thing I have ever done is be open and honest about my mental health. "I feel prouder than ever about how I came through the darkest days and be able to help others, which is why I feel I need to be open and honest for the first time about another problem that has been part of my life since I was 16 years old." Meanwhile, the head of the NHS has said Premier League football clubs should do more to help tackle gambling addiction. Simon Stevens, chief executive of NHS England, said reports that some foreign betting companies are "failing to play their part" in funding services to treat problem gamblers are "deeply concerning".